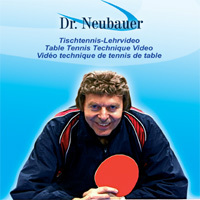 This new table tennis technique video in DVD format includes 50 different techniques with Anti-Spin, long pimples with friction, half-long and short pimpled rubbers as well as defensive reversed rubbers. 20 of these techniques are being performed with Dr. Neubauer's new Anti-Spin rubbers 'Gorilla' and 'Grizzly'. This video is especially recommended for all players using the new rubbers 'Gorilla', 'Grizzly', 'Monster Classic' and 'Boomerang Classic'. The technical strokes are being performed with Alan Cooke (former European vice-champion) and Bastian Steger (Bronze medal at the World Championship and European Champion with the German team). The total running time is 96 minutes.